Kakslauttanen is one of the best places in the world to see the magical glow of the Northern Lights. The season lasts from late August to late April. We provide the perfect opportunity for observing Aurora Borealis as the season is long, there is virtually no light pollution and very few trees obscuring the sky nearby. And naturally the view from our Glass Igloos and Kelo-Glass Igloos is unbeatable. However, we cannot guarantee Northern Lights or any other natural phenomenon. There are many things that affect the visibility of the Northern Lights like magnetic activity, position of the sun and cloudiness of the sky. However, we can give you a few tips. The lights might unexpectedly appear and just as suddenly vanish any time from just after sunset to just before dawn. They can last for 5 minutes or they can last for the whole night. Even if you are not staying in a Glass Igloo you can and you should go outside when it gets dark, just dress warmly. Finnish Meteorologic Institute that has real time info and predictions of the Northern Lights, please see http://en.ilmatieteenlaitos.fi/auroras-and-space-weather. Aurora Borealis are visible from late August till late April. Although Kakslauttanen is located in the wilderness, it still benefits from excellent air and land transport connections. You can combine your stay in Kakslauttanen with a city break in Finland’s capital, Helsinki, as all flights to Lapland depart from Helsinki-Vantaa Airport (HEL). The closest airport to Kakslauttanen is Ivalo (IVL), which is just a 30-minute shuttle bus ride away. You can book your airport transfer at the same time as booking your stay. Ivalo is currently served by Finnair (from Helsinki all-year-round and London starting autumn 2017), Lufthansa (from Frankfurt) and Norwegian (from Helsinki). Schedules vary depending on the season. 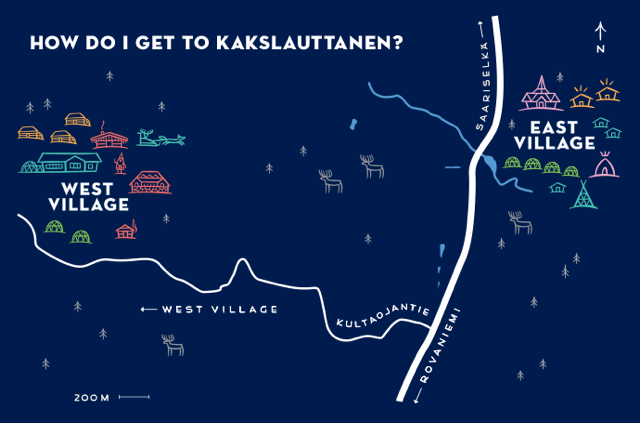 If you are touring around Lapland or flying to other airports in the region you can always take a bus to Kakslauttanen. Buses to and from Rovaniemi all stop at Kakslauttanen, and the journey takes about three hours. Tickets can be bought from the driver. For timetables, visit the website of Matkahuolto, a Finnish company that organizes bus trips nationwide. If you’re arriving by car, just type our address (Kiilopääntie 9, 99830 Saariselkä) into your GPS navigator and you'll find us easily. We offer free parking, and Lapland has excellent roads. Read more about getting to Lapland on the official Lapland tourist site, OnlyInLapland.com. There is excellent mobile coverage right across Finland, including in Lapland. We like to think that once you are here in the wilderness, you can also take a break from technology and the internet – but we also understand the need to get online to get in touch with friends and family. This is why we offer complimentary internet in all of our accommodations, reception and restaurant area. Yes you can! Finnish law dictates that you must mark your drone with your name and contact information and the maximum flight height is 150 metres (about 500 feet). Remember to fly your drone within the restrictions of the user manual regarding temperatures, and remember to be sure of your insurance should any malfunctions happen. You cannot publish recognizable images or video of people without written consent, and flying over crowds of people is prohibited. In our Glass-Igloo sections, flying of drones is permitted daily from 11:00 until 12:00 (11am to 12pm). The area surrounding Kakslauttanen has plenty of pure, natural superfoods available for picking. Just a short stroll away you'll find blueberries, lingonberries and cloudberries as well as bolete and matsutake mushrooms. You’re free to pick and eat any of these tasty treats! For your safety, before eating any food you collect in the wilderness, we suggest that you show it to a member of our staff who can give you information about features, cooking suggestions and possible risks. Sauna and Finland are inseparably linked. For relaxation, nothing in the world beats a sauna, which is why each Kakslauttanen chalet has its own electric sauna. We also have smoke saunas available for you to reserve and enjoy. Go ahead and give it a try—the soft steam of a smoke sauna will make you feel like you're travelling centuries back in time. One layer of thermal underwear is the best option. We will give you woollen socks, hat and a sleeping bag. It is a good idea to exercise a little just before going to the sleeping bag and eat something little to give energy like chocolate. All the seasons have their special flavor. The magical Midnight Sun in the summer, the magnificent autumn colours Ruska in the autumn and blazingly white snow under Aurora Borealis and Kaamos light performance in the winter. All the seasons are so different, so why not experience them all! The Aurora Borealis (Northern Lights), one of the most magnificent natural phenomena, usually appears in the night sky between end of August and April. Like with many other natural phenomena, Northern Lights have appeared in a number of myths and tales. Some people say that Aurora Borealis is spirits moving across heaven. Or that they are reflections of the shields of the mythical female warrior Valkyrie. Another legend goes that they are sparks from a foxes' tail hitting a top of a fell. Nowadays scientists know that Aurora Borealis is caused by solar winds hitting Earth's upper atmosphere about 100 km high in the sky. The Earth's magnetic field directs the flow of electrons from the sun to the magnetosphere above the magnetic North and South Pole. This is the reason that best places to see Auroras are above the Arctic Circles. Statistically the best time for seeing auroras is just before the midnight. Northern Lights occur also in the summer, but the Midnight Sun and the light sky of the summer nights prevents us from seeing them. Hotel Kakslauttanen offers a very good opportunity to see Aurora Borealis, as it is located 250 km above the Arctic Circle and there are is very light pollution. One of the best way to see Aurora Borealis is to spend a night in our unique Glass Igloo. Aurora Borealis are visible from late August till late April. Lapland is a vast geographical area laying in the northern most part of the Scandinavia spreading to the area of the four different countries: Finland, Russia, Norway and Sweden. It is the magnificent land of fells, reindeers and Northern Lights. The population density in Lapland is about two persons/km2, which means that most parts of the Lapland are untouched wilderness. Finnish Lapland is 98 937 km2 large, representing 30% of Finland's total land area. Of this area 93 057 km2 is land and the rest is water. The highest peak of Lapland is Halti 1328m. Before coming to Kakslauttanen, many of our guests have concerns about the coldness of winter. As we are situated north of the Arctic Circle, it does get cold here in the winter – but not in the way you might imagine. This is because winters are dry, and the weather here is very rarely windy when it is freezing outside. The frost does not bite as hard as it does by the sea, where the air is more humid. So please don’t worry about it – besides, with us you can find all the clothes and hospitality that you need to keep warm. Late in the winter, closer to the spring, the weather will warm up nicely, even though there is still a lot of snow. There are long hours of sunshine during the day, and the light effect is magnified by the white snow. In the summer, there is nothing as magical as the midnight sun. From June to August, the sun doesn’t set at all. Daytime temperatures are around 20 degrees Celsius. The summer season ends in early September, when the ruska period of changing colours commences. For about three weeks, nature is ablaze with the most incredible colours. This is a marvellous time for observing the northern lights (aurora borealis), as you can see colours all around you. The northern lights can be seen from when the nights start to grow darker, in late August, until the end of April. Lapland has four different seasons and the temperatures vary accordingly: Summer (June-August): Temperature differs surprisingly little form the average temperature of the European continent. Temperature may rise over +30°C with temperatures closer to +20°C during the days being more common. Autumn (September-November): In the autumn when the days get shorter, the average temperatures are somewhere between 0°C and +10°C. Lapland gets usually first snowfalls in the end of September, but it won't usually be before the end of October, when snow completely covers the ground. Winter (December-April): The winter temperatures can vary anywhere between 0°C and -40°C. The average temperature in January is -14°C. But the cold is not biting because air is dry. There can be as much as one meter of snow and it usually lasts until May. Spring (April-June): Spring is a time of a rapid and violent awakening of nature. Snow disappears during the first part of the May. The average temperature in the spring is somewhere between 0°C and +10°C. In the spring the nights can be still quite cold and the days warm. More information can be found on Finnish Meteorological Institute website. In the summer the most important thing to wear is good boots. A pair of good hiking boots does well. If you are planning to go picking berries or mushroom or fishing it is always a good idea to bring a pair of rubber boots, which can be rented from the hotel. In the summer you will also need something light to wear during the day and something warm like a pullover for the evenings. It is also a good idea bring a waterproof jacket and a hat to protect you from the sun and insects. In the winter the most important things is to dress up in layers. First of all you need good thermal long underwear, then another layer of something warm like wool or fleece. On the top you will need good garment, which should preferably be water and wind proof. The most important thing to remember is that you should be totally covered from head to toes. For example if you do not wear a hat with the rest of your clothes being the best possible winter gear, you will feel cold. It is also very important to remember to avoid getting wet both on inside and outside. This is especially important with your socks. Always use clean socks, preferably made from material other than cotton, which tends to get cold when wet. You can also rent winter outwear from the hotel. Read more about layered clothing. Kaamos is a mystical period between December and January when the sun does not rise at all. Nonetheless it is light from 10 in the morning till 15 in the afternoon (the light period lasts around five hours). White snow makes this period much lighter. Kaamos is a time of phenomenal Arctic light performance, during which sky is blue when look North and red in the south. Around 2PM every day so called "a blue moment" takes place, when everything including the sky and snow turns blue for 15 minutes. This unique nature phenomenon occurs only here in the Arctic area and you cannot encounter it anywhere else in the world. Lapland becomes colourful in the autumn; it is time for Ruska, the autumn colors. Ruska is nature's last show before snow covers landscape once again. Many trees, such as birch, aspen and mountain ash, whose leaves turn to bright yellow or deep scarlet, make the scenery more beautiful than ever. The hillsides are ablaze with colour and the whole landscape is like a huge impressionistic painting. The exact time of ruska is impossible to predict, but it is usually at its best between last week of August and mid-September. Autumn is also the time when it is time to collect nature's crop from the forest. In autumn Lapland forests are full of berries, mushrooms and herbs ready to be picked up. Summer nights in Lapland are bright as a day for approximately four months from the end of April till the end of August because of the magical midnight sun. For a month in June and July sun does not set below horizon at all. During this whole time sun floats over the horizon, casting light day and night over the striking Lapland scenery. There are few things in the world that are more beautiful than Lappish scenery opening from the top of a fell on a cloudless summer night. It is no wonder that Lapland is often called the Land of the Midnight Sun. The Sami People are indigenous people of Lapland. Sami's culture, language, traditional clothing, handicraft and music are distinctively different from other ethnic groups in Scandinavia. Though few in numbers, Sami's culture is a true gem of Northern Lapland. They are a Samoyed tribe, who once arrived from the East. Originally they had no racial or linguistic relationship to Finns, though over the years the two cultures have mixed with each other. Reindeers are still fundamental to the Sami culture and society, even though nowadays a majority of the Sami population pursue other careers. However, most Samis have a family member or a relative who in some way are involved with in reindeer herding. Sami culture is still distinctly visible in everyday's life in Lapland. Today you can still hear someone speaking a Sami language in Lapland or wearing part of the traditional clothes or jewelry. The traditional Sami singing joiku can still be heard on many occasions. Even traffic signs in Lapland are duplicated in Sami. More information on Sami can be found on the website of Siida - Sami Museum and Northern Lapland Nature Centre. All our prices and services include gratuity and local taxes. The water coming out of the tabs in your chalet or igloo is sone of the cleanest you can find on this planet. It's as pure and fresh as the arctic nature.